The popularity of wide-format printing is rising. HP’s wide-format printhead technology has boosted them above the competition in the wide-format printing market. In fact, HP is the number one global supplier of wide-format ink for the $2.32 billion market. A report that breaks down ink into categories of UV, latex, aqueous and eco-solvent projects revenue from wide-format ink supplier to rise to $2.46 billion by the end of 2016. Last year, approximately 1.27 billion gallons of ink were shipped globally. 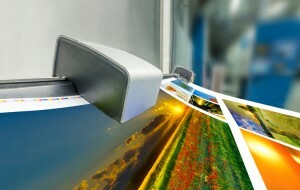 Wide-format printing is a competitive and growing industry. If you’re interested in equipping your printing company with a wide-format printer, talk to our sales team about our wide-format printer options. Already have a wide-format printer? Call us if you need maintenance or want to upgrade. This entry was posted on Friday, May 20th, 2016	at 11:31 am	and is filed under Printing news	. You can follow any responses to this entry through the RSS 2.0	feed. Both comments and pings are currently closed.